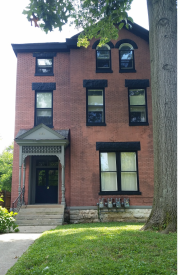 This beautiful 4 plex located in the historic Old Louisville neighborhood has been recently remodeled. New hardwood floors, counter tops, appliances and more. 1 unit has spiral steps leading up to the bedroom. Large fenced in backyard for peace and quiet. Fire escape for back door entry. Great monthly income.